Infant GERD symptoms CHECK LIST! Because the only way a baby can tell us something is wrong is by crying. So how do you tell if they're crying because of baby reflux? We explain some signs to look for below. All babies reflux usually in the first year of their lives. This is true. That's what's considered GER (Gastro-Esophageal Reflux). But when the reflux is continuous over "time" (as shown in the chart above) and starts to cause pain, that's when baby reflux turns into a condition called GERD. THE LIST BELOW will provide you some symptoms that point to baby reflux. Just run down this list and ask yourself, "Does my baby have acid reflux?" and' "Is it causing my baby PAIN?" Pain from baby reflux is when the reflux is recurring so often the acid in the reflux starts to hurt the tissue in the esophagus. That's when it's considered a condition or disease and that's when treatment should be considered before short and long term symptoms get worse. We know you've been told that most babies outgrow reflux in the first year of life. But why should your baby have to suffer for a WHOLE YEAR? There's no reason you or your baby should have sleepless nights or more critical issues such as failure to thrive and other long term issues like feeding aversions. 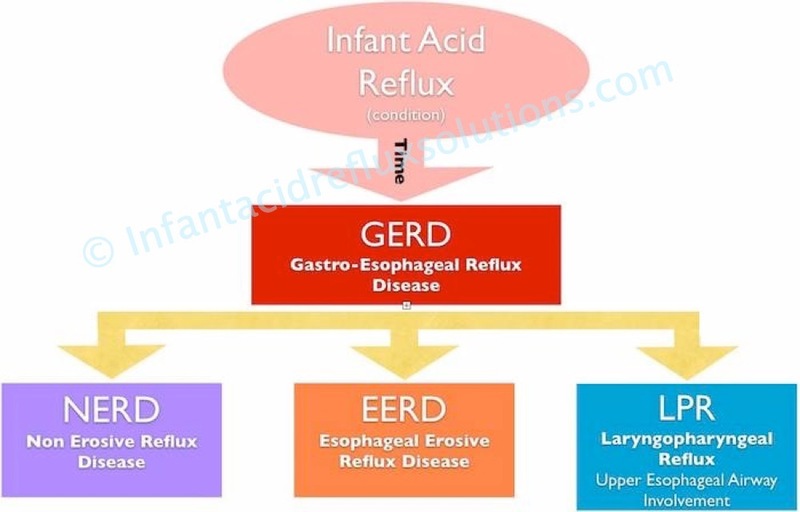 These infant GERD symptoms listed below were created by a team of physicians and specialists that were involved in the 12 year study of infant reflux at the University of Missouri. That study was called MarciKids. The symptoms can be combined or independent. The best way to determine if your baby has reflux is to fill out this questionnaire so our on staff doctor can reply in an email consultation for free. When a baby is in pain with these reflux symptoms, we know there is nothing mild about it. Grunting: Hint: If your baby doesn't poop right after the noise the most common reason is because of gas and the gas is due to acid reflux or gas build up to the esophagus. Shaking head back and forth and up and down. Symptoms can be non-specific but if you pay attention to when they occur and document them by using our infant acid reflux questionnaire either to submit to us for help or as a baby reflux journal, you can monitor when these symptoms are worse for you and your doctor. If you need a doctor that will listen, connect with our INFANT ACID REFLUX PEDIATRICIAN for an online appointment. Although these more severe infant GERD symptoms are not the norm they are very real possibilities. They are not intended to scare you or intimidate you. They are here for those families that are experiencing these very real issues and have nowhere to turn. This was a controlled study of infant GERD symptoms and may not be representative of a National average. 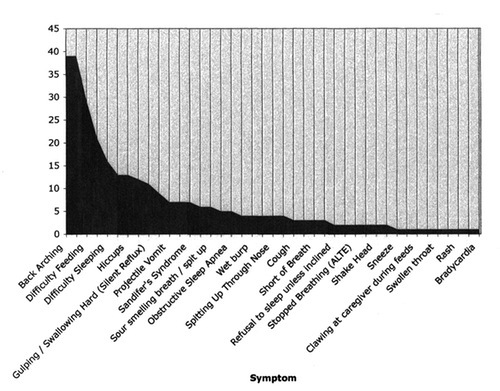 As you can see from the chart above that many of the symptoms, mild or severe, are listed here. The important thing is to look for recurring signs and symptoms that seem to be uncontrollable or treatable. If you feel your baby is not developing normally or you are seeing any of the GERD symptoms in your child it is very important to consult a care provider that specializes in infant acid reflux. We're also here for you to answer questions and to offer support. Please use our contact us page to get in touch with us and we assure you, your emails will be answered within 24 hours if not sooner. Here is some additional information that may be helpful in understanding why certain infant GERD symptoms in infants can be harmful. Reduced Salivation: Saliva contains a natural buffer (bicarbonate) that neutralizes acid in the esophagus. If the production saliva is reduced it is not able to protect the esophagus and that allows damage from the stomach acid to occur. Impaired Peristalsis of the Esophagus: The esophagus is a muscular tube that squeezes food towards the stomach (just like you would squeeze your tube of toothpaste). This action is called peristalsis. It keeps what we eat moving in the right direction. Impaired peristalsis allows what ever is in your baby's stomach to move in the wrong direction. It allows the "refluxing" of the contents back into the esophagus. Failed Natural Lines of Self-Defense within the Tissue: Each part of the gastrointestinal tract has its own defense system to protect itself from stomach acid (as well as other irritants). If these defenses are compromised, the tissues lining these organs become vulnerable to injury from the stomach acid. Problems of the Lower Esophageal Sphincter (LES): Reflux is especially present in infants because the lower esophageal sphincter (LES) does not reach its full maturity until eighteen months of age. There is also a condition called Transient LES (TLESR) which are brief moments when the esophageal sphincter opens, giving way to the pressure of the stomach and allowing its contents to reflux into the esophagus. Many problems are due to a weak resting tone of the esophageal sphincter muscles, in which LES cannot maintain a strong seal. Delayed Gastric Emptying (DGE): The muscular walls of the stomach have coordinated contractions to keep stomach contents moving through it. If the stomach doesn't allow itself to empty as regularly as it should, pressure builds up within the stomach and the contents of the stomach begin pushing on the LES, making reflux much more likely. Pyloric stenosis is one cause of delayed gastric emptying. This condition is a pathological, or diseased, narrowing of the lowest part of the stomach, or pylorus. This narrowing slows the rate at which food can leave thee stomach, allowing pressure to build up in the stomach. Acid Production Issues: Reflux disorders don't always mean that there is an excess of acid that is being produced. Acid production still plays the major role, especially for patients who have already developed damage in their esophagus or stomach. Acid production fluctuates during the day, but can flare up depending on diet, stress or conditions such as teething. This tendency has a great variable among infants. The University of Missouri, Dr. Jeffrey Phillips, Dr. Marcella Bothwell and an eager intern that was assisting Dr. Phillips and Dr. Bothwell (Lauren Stephens) took the time to interview many of the Mom's and Dad's that participated in the treatments for infant acid reflux offered by Dr. Phillips. Lauren compiled extensive information regarding infant GERD symptoms in infants. Here are some of her findings in addition to a graph that exhibits her research. The Infant Acid Reflux Solutions team has had the pleasure of working with the Mom's and the Dad's caring for infants with infant acid reflux for many years. Our team has seen first had the impact that this condition and/or disease and how it effects the parents and the siblings. The substantial emotional, financial, social and mental impact of having a child with infant acid reflux can cause such enormous stress on a family. This is a subject rarely talked about but we know that this is a very real symptom and one that can drastically change a family dynamic. Consider all the infant GERD symptoms listed above and imagine how any one of them could change your life and the perception of your family. Some moms have sworn off having more children because of it. Many of these stories are written here on "your feedback page". These stories are from the Mom's and Dad's that have experienced these symptoms first hand. Some of you will be able to relate to these parents from your own experiences and others the stories will touch your hearts. We personally want to thank each and every one who contributed and shared their stories.